The parish is dedicated to Our Lady of Good Counsel. The beautiful prayers which follow are recited after morning Mass every Saturday in the Parish Church. You may wish to make them part of your own prayers. There is a short note after the prayers outlining how devotion to Our Lady of Good Counsel came to be and on the role of the Augustinians in promoting this devotion over the centuries. Jesus, Lord and Saviour, from the cross you gave us your mother Mary as an example to imitate, as a disciple to follow, as a mother to intercede for us. Let us now remember Mary for her complete openness to God’s will as she totally cooperated with His grace. Mary remained faithful to the God who called her. We ask her to stand with us in our lives as mother, sister and friend. In the varied situations and choices which face us each day, help us to become more and more like Jesus your Son in our thoughts, attitudes and behaviour. 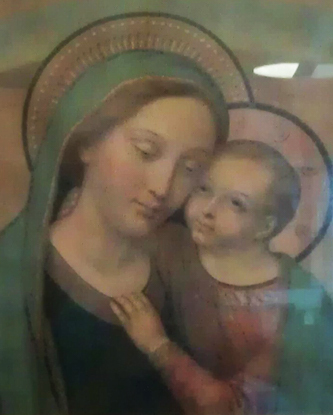 Mary, Mother of Good Counsel, You are the first and most faithful of Jesus’ disciples. Our God chose you to present His Son to the world. Guide us on the path that leads to Him. In this passing world our vision is blurred and our judgements uncertain. We come to you for guidance, that we may know Jesus more closely and put our trust in him. We ask you to be our guide and counsellor in this world. Obtain for us, from your Son, pardon for our sins and the gift of everlasting life. Instruct us in the way of generous giving that we may share His and your love for all. Why Our Lady of Good Counsel? The town of Genazzano is about 48km (30 miles) south of Rome. The Church there was entrusted to the Augustinian Order in 1356. According to tradition, in the year 1467, in the midst of festivities for the feast of St. Mark, the townsfolk suddenly heard “exquisite music”. A mysterious cloud was then said to have descended and obliterated an unfinished wall of the Church. In front of the people , the cloud dissipated and a beautiful fresco on a thin layer of porcelain and no more that 18 inches square, of the Blessed Virgin Mary and the Christ Child, was revealed. Many miracles are said to have occurred in the portrait’s presence and it was widely believed that it had been miraculously transported from Albania. Many Popes had special devotion to Our Lady of Good Counsel. Pope John XXIII came to pray at the shrine for guidance before he announced the calling of an Ecumenical Council (Vatican 2, 1962-64). Saints who had special devotion to her included Aloysius Gonzaga, Alphonsus Liguori and John Bosco. The Augustinian Order given its ties with Genazzano has contributed to the spread of this devotion internationally. Many institutions worldwide have been named in honour of Mary under the title of Our Lady of Good Counsel. The Parish and Church here in Ballyboden, where Augustinians minister, are now among these institutions.